Let us remember the life and ministry of Rev. James Charles Watson of Chatham, MA who died on December 28, 2015 at the age of 96. Jim Watson grew up on Long Island NY, where he met and married his lifetime partner, Marion Doré in 1943. He trained as a machinist/tool-maker and supervised building artillery gun-sights during WWII. When the war ended Jim and Marion, with their two-year old son Dennis, attended Houghton College. He earned a master of divinity degree from New York Theological Seminary and a master of arts degree from Union Theological Seminary. Jim was a local pastor in the NY East Conference where he served Belmont UMC for two years. 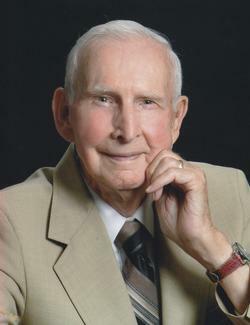 He was ordained as a deacon in 1952, then ordained as an elder in 1955. He served as pastor for 35 years in three Long Island, NY churches: Glen Cove, Plainview, and Merrick. During his ministry he was active in ecumenical activities, serving as president of the Long Island Council of Churches for three years, and was awarded several honors for fostering brotherhood and social justice. A trip to the Holy Land in 1972 convinced Jim of the spiritual value of travel to religious sites, prompting him to host tours, first to the Holy Land and Oberammergau, Germany. After his 1982 retirement he and Marion organized group travel under the name “Memorable Tours,” visiting over 50 countries. The home base for Jim and Marion became Chatham, MA where they expanded the vacation home they had built in 1968. They became active members of the First United Methodist Church of Chatham. Jim enjoyed flying lessons at the nearby airport and sailing on beautiful Pleasant Bay, which he continued to do into his 90’s. After tending Marion through her long illness and her death in 2007, Jim’s loneliness prompted him to send an e-mail to his children, informing them he had invited a young blonde to live with him: Zoey, a camel-colored Lab-Pit Bull mix, who became his loyal and loving companion. Jim was able to stay in his home until the end, with the care and support of Seniors Helping Seniors, Companion Caregivers, and Hope Hospice. Jim is survived by a sister, Ann Caton, of Bablyon, NY, his three children: Dennis F. Watson of Fredericksburg, VA; Ellen Doré Watson of Conway, MA, and Doc Watson of Manorville, NY, as well as seven grandchildren and six great-grandchildren. A service celebrating his life was held at First United Methodist Church of Chatham on Saturday, January 2, 2016 at 11:00 am. Donations in his memory may be sent to First United Methodist Church of Chatham, 569 Main Street, Chatham, MA 02633 or to Hope Hospice, 765 Attucks Lane, Hyannis, MA 02601.